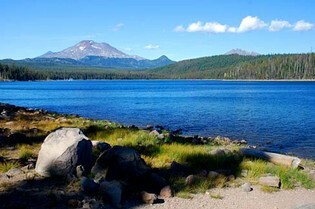 Welcome back to the Historick Elk Lake Guard Station, located on the beautiful Deschutes National Forest! Since Elk Lake GS re-opened its doors as an interpretive site in 2001, PIT volunteers have been recruited and trained to staff the Station as uniformed, professional-caliber information/interpretation specialists for the site's thousands of annual visitors. Continuing that tradition, we need your help again this year! Volunteers will keep the station clean and tidy, and will provide a full range of information and interpretive services to visitors. Each session will be two weeks long, Tuesdays and Wednesdays off - and there is so much to see and do here in those hours "off the clock," that you may just want to come and stay! See you this summer!